Established in 1987, Formseal have become the UK’s largest manufacturer & supplier of brush strip seals & ancillary products. We offer a friendly and efficient service, working hard to fulfil customer requirements. Formseal products are highly sought after by Specifiers, Engineers, UK Designers and End Users. Our products are not restricted for use in any particular industry or environment, only when a flexible seal is required. Our technical support team have the experience and expertise to offer guidance in all areas of brush design. 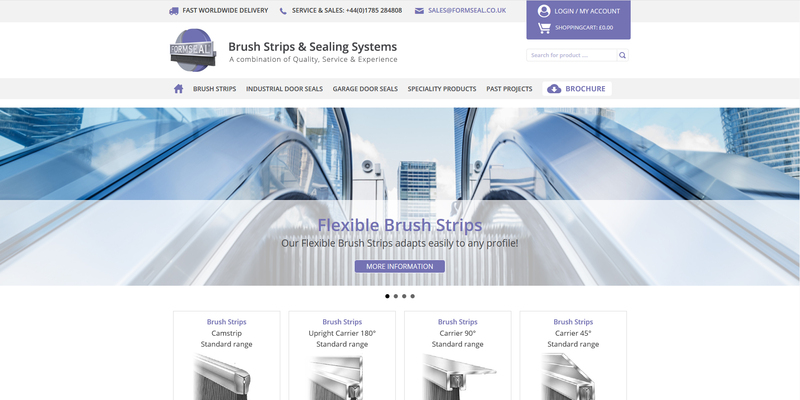 Brush Strips – Door Seals – Standard range includes six brush section sizes with over forty trim lengths from 8mm to 300mm. With or without aluminium fixing carrier. Order by 1pm for next day delivery. Formseal Concertina Door Kits are custom made to suit doors of any make or size and can be sealed at both the top and bottom. Formseal are suppliers of door seals for ‘Up & Over’ Garage Doors for Domestic & Commercial use. Formseal’s speciality products include Anti - Static Brushes, Bottom Door Seals & Lath Brushes. Thank you for packing my order. Living off shore from the UK mainland, I was glad to see you have put so much effort into packing the brush strips to ensure they arrived with me exactly as they left you. I fitted the brush seals to the gap at the top of my garage roller doors yesterday and immediately noticed a reduction in draughts. Thanks again from a very satisfied customer.